Congratulations to the North Shore High School Robotics team who won the Long Island SBPLI Regional Championship under the direction of Mr. Peroni and Ms. LeMar at Hofstra University. They competed in alliances of three in the “Recycle Rush” competition against teams from around the world including Israel, Brazil and Canada. The winning team comprised of North Shore, Westhampton Beach and Connetquot had to successfully build and manipulate their robots to achieve the most points in an original game that consisted of stacking recycling containers, totes, and litter (e.g., swimming pool noodles). North Shore will continue on to the First Robotics World Championship in St. Louis on April 22-25, with their robot, Patches O'Houlihan! 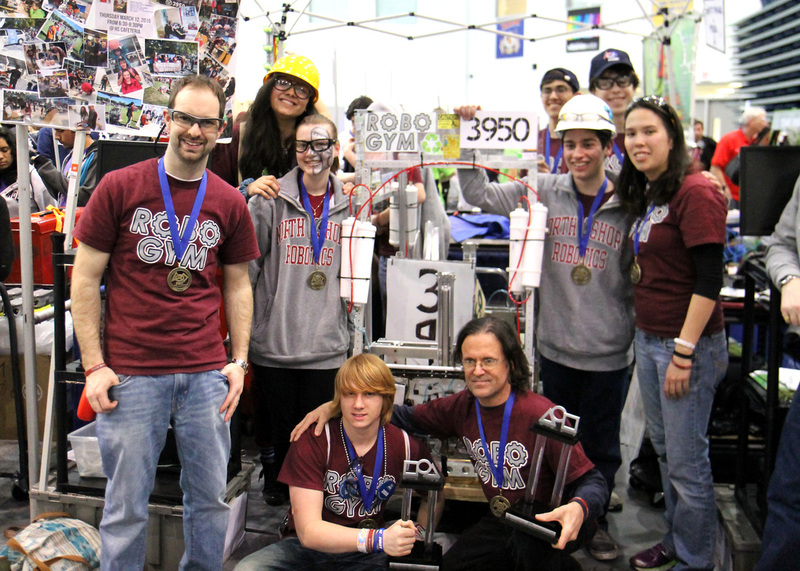 The North Shore Robotics team (Team 3950), known as Robo Gym, is named after the movie Dodgeball and is comprised of 42 students (approximately one-third of the team are girls).. Congratulations go out to the following members of the team: Shannon Alvarez, Sam Aranoff, Ariel Avgi, Alaina Van Pak, Justin Baadaroni, Jacob Berlin, Martha, Braun, Wilson Braun, John Carbonara, Joe Cavanaugh, Maaz Cheema, Brian Ciampa, Connor Creavin, Genevieve Delfin, Michael Gaudiosi, Matias Gonzalez, Grant Goodman, Nick Green, Tom Grogan, Emma Haley, Matt Hardie, Sarah Hartmann, Jocelyn Kleiger, Patrick Morley, Kyle Olstein, Talia Pelts, Neil Rawal, Kinsale Reilly, Michael Roberto, Bryce Roth, Nick Rubertone, Stephen Saccone, Nick Sakry, Zach Saltzman, Michael Santucci, Sam Scheer, Rob Sharkey, Joey Spivack, Chrissy Syracuse, Alex Vallone, Helena Yun, Matt Zapken, and Alex Lacomba. In addition, bravo to Emma Haley who sang four different National Anthems for Israel, Brazil, Canada, and the United States at the event! Benefits of the FIRST (standing For Inspiration Robotics in Science and Technology) Robotics Competition (FRC) include: being eligible for more than $20 million in college scholarships, learning from professional engineers, building and competing with a robot of their own design, learning and using sophisticated software including Solidworks and Autodesk plus industrial grade parts, and competing and collaborating in alliances and tournaments. Additionally, team members make presentations at the elementary and middle schools, participate in Homecoming, are involved with the high school Life Skills program, present at Back-to-School Night, and are involved in Sports Night. For the past two years, Robo Gym, has also hosted an Engineering Night at the high school and invited students from the elementary schools to experience different aspects of STEM (Science, Technology, Engineering, and Math) from learning to solder to driving the teams old robots. Mr. Peroni concluded that, “Students involved in robotics learn how to ‘Think like an Engineer’. They work alongside real world professionals, and gain invaluable experience and knowledge, not ordinarily obtainable in high school.” They acquire many skills including science, technology, engineering, math, computer design, business, public relations, advertising, and community outreach. In addition, they work side-by-side with professional mentors specializing in engineering, computer design, and sheet metal including Mathew Hayduk, Robert Saccone, Kevin Reilly, Chris Roberto, and Tom Braun for six weeks to strategize, design, and build a successful robot to utilize in the competitions. Many thanks to all of the sponsors, mentors, and parents who dedicated their time and services to the North Shore Robotics Team. 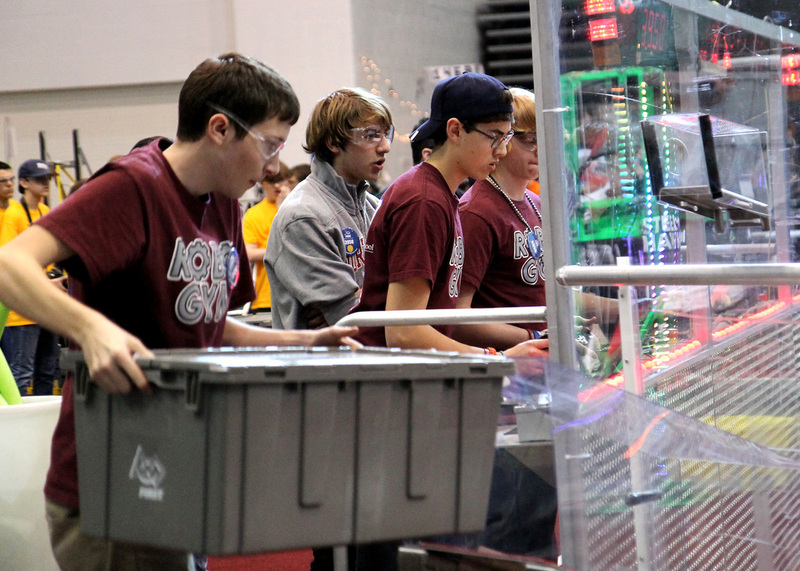 Best of luck to the team as they continue on to the First Robotics World Championship in St. Louis onApril 22-25! Article by Shelly Newman with assistance from Mr. Peroni and Ms. LeMar.